The successful loading of dental implants necessitates the presence of sufficient bone mass in the area where the dental implants will be placed. There will be no problems for patients who have sufficient bone mass – the placement of dental implants can go on as planned, without any foreseeable complications. However, for patients who have insufficient bone height in the upper jaw area – a sinus grafting procedure by the dentist at Woodbury Dental and Laser Clinic a may be necessary prior to the placement of dental implants. It is very common to find that the softer bone in the area above the upper back teeth (the molars and sometimes even the premolars) is very shallow, thus making it unsuitable for the placement of dental implants. To solve this problem, a procedure known as sinus grafting (also called “sinus augmentation”, or “sinus lift”) was developed. Sinus grafting is technique used to augment the bone mass of a patient who has insufficient bone height in the upper jaw area – in preparation for the placement of dental implants. Also called a sinus lift, the sinus grafting procedure by a the dentist at Woodbury Dental and Laser Clinic is done to move the sinus membrane upwards, thereby creating enough space in the upper jaw area for the bone grafting material that will augment the upper jaw’s height – so that dental implants can be placed without any difficulties. A sinus grafting procedure’s importance is seen in cases when the sinus wall does not have the necessary height to support the proper placement of dental implants. The sinus graft procedure will enable a Kent dentist or dental surgeon to move the sinus membrane upwards (a sinus “lift”), so that a space can be created for the sinus grafting material to be placed. After the sinus grafting material has been given enough time to integrate with the surrounding bone structure, and after sufficient upper jaw height has been achieved, the dental implant procedure can then be done successfully. Extensive bone structure deterioration in the upper jaw, which may be the result of gum or periodontal disease. Insufficient bone mass or height in the upper jaw bone area, which is necessary to support the successful placement of dental implants that will address missing teeth concerns. The maxillary sinus of the patient being too close to the upper jaw, which results in a high level of difficulty of the dental implants being placed successfully. The sinus grafting procedure starts with a Kent dentist getting X-rays or CT scans of the patient’s upper jaw and sinus areas, to be able to have a clear image of the sinus grafting procedure that will need to take place. In cases when the sinus grafting material to be used will come from the patient’s own body, a prior surgical procedure will need to be done in order to harvest the bone grafting material from another part of the body. 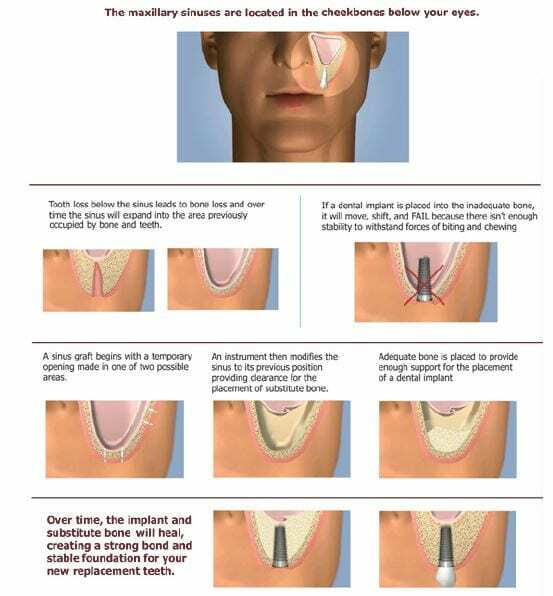 The bone grafting material usually comes from the patient’s own hip bone, or from the leg. A local anaesthetic will be used to numb the area where the sinus grafting procedure will be done. The dentist at Woodbury Dental and Laser Clinic or surgeon will make an incision in the gums, so that the sinus membrane and the bone underneath can be exposed. The sinus membrane will then be moved upwards (or “lifted”), to make enough space for the sinus grafting material to be placed. The sinus grafting material will be placed in the area that needs to be augmented (in the space freed by moving the sinus membrane in an upward motion), to ensure that the upper jaw achieves improved height and overall bone mass for dental implants to be placed successfully. The gums will then be put back into place and stitched closed. A healing period that can span a few months will be needed, to give the sinus grafting material enough time to integrate with the surrounding bone tissue. The healing period will also allow bone regeneration in the upper jaw area, so that sufficient bone mass and height can be achieved. After the healing period has been finished – and after the sinus grafting material has been given enough time to integrate with surrounding upper jaw bone tissue – the dental implants can then be placed. 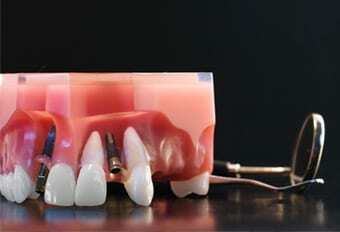 The implants will in turn need a period of about three to six months to heal, before teeth restorations (such as a dental crown or a dental bridge) can be attached.